Background: This is my wife's 2001 Accord EX with 179K miles. We're the second owners, and I've done all the maintenance and repair work on it, since purchasing in '09 (including a T-belt replacement around 90K). Recently, we got another, much newer vehicle, and I'm putting the Honda up for sale. Before I do that, I'm replacing the timing belt and water pump—I want to make sure this vehicle is in good shape for the new owner and, to be honest, I think it's worth more with that work completed, too. The Issue: The car has had a slow oil leak from the driver's side for a long time, and I assumed that it probably needed a crankshaft seal. But, now that I've got everything removed on the front of the block and the timing covers off, the crank seal actually looks pretty clean and dry... while the entire right side is a mess: thick oil and junk everywhere around the rear balance shaft and water pump. I want to get this cleaned up and fixed, so what am I looking at here? What's the likely cause and what are my next steps? Thank you! Last edited by ctgriffi; 01-17-2019 at 12:20 PM. What is the highest point that has oil? Is there oil on the back of the block? 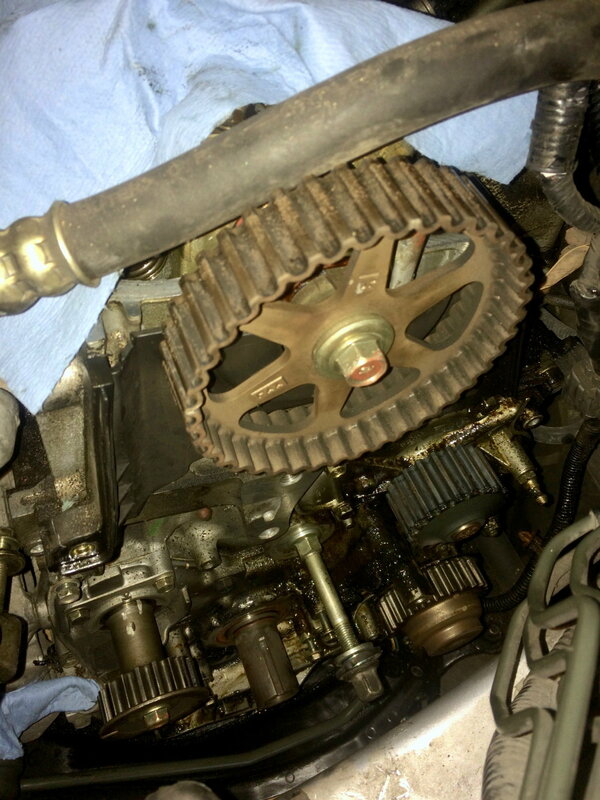 If you trace the oil leak to the rear balance shaft, that has a gear-drive which can be replaced and/or resealed pretty easy now that the timing belts are off. Maybe it's the valve cover gasket? Also pretty easy to replace. If it's on the side of the block (rather than inside the timing cover) then look at the oil pressure switch. Those can leak through the switch & make a mess at the electric plug/socket. It really depends on where the leak is. Are you sure it's engine oil leaking? Just asking as power steering lines run around the engine in that area. I know, because I've replaced both power steering lines and hoses on my 99 Accord (same body series, same engine), as both developed leaks. Otherwise, look at the places Jim pointed out. Thanks for the responses, and sorry for the delay... So, the oil is mostly on the front of the block, around the rear balance shaft. You can see that there is some oil down near the crankshaft, but I think that's just gravity drawing it down there—like I mentioned before, the crank seal itself is dry and fairly clean. Take a look at the photo, please. Appreciate the opinions and suggestions! If this is a rear balance shaft issue, I'd like to hear more about that fix. Trying to identify the source of oil leak on front of block (mostly right side). I'd recommend purchasing the 98-02 pdf accord shop manual. It is ~$22 on automanualsource.com and worth every penny of the investment. Definitely look at the camshaft seal. The 94-97 accords had a seal behind the rear-balance shaft sprocket (lower right sprocket in your picture). I remember reading that seal was prone to getting brittle with age and leaking with age. The 98-02 2.3L engine has a seal behind the balance gear case. See page 7-18 of that manual I recommended. Just make sure that you lock the rear balance shaft at TDC by inserting a 1/4 inch drill bit or the bolt recommended in the shop manual to hold the rear balance shaft in place (see 6-28 in that shop manual). I've locked the rear balance shaft and then removed that pulley/gear assembly. I'm planning on replacing the o-ring seal behind the ***'y, but I also noticed that there's quite a bit of "play" in the pulley itself (see video link, plz). I'd replace the "O" ring on the back side and put it back together. The play you're showing is in/out play, which I don't think is your problem (it's there to allow for gear mesh). To me in your photo above, it looked like the oil was coming from above the water pump. Don't know if the oil pressure switch is located in that area (on the back side) or not, but it could be leaking there and spraying. While you're in there, I'd add a "balance shaft clip" to the front balance shaft. I get them from Rock Auto for 4.95 plus shipping, or 11.95 from CarQuest. It's a good cheap investment, and the next owner will thank you for doing it. Thanks for your reply, Bob! There is a good bit of oil around the water pump (and some above it), but... there's about 3x as much oil on/around the rear balance shaft pulley. Since everything is rotating counterclockwise in there, I figured maybe the leak was coming from around the balance shaft, then being thrown up onto the water pump. Still, you may be right, hard to say. Outside of cleaning it up, putting it all back together, and then running it a bit with the timing covers off, I'm not sure it's possible to know exactly. Yeah, there is a retaining clip mounted on the front balance shaft already. IIRC, I added that when I did the job 8/9 years ago, thanks to a tip from the guy at the Honda parts counter. From what I can tell, that o-ring gasket for the rear balance gear ***'y is a dealer-only part. That sound right?